The moment you drive up to Birchwood Lodge, you get a feel for the description they use to define the lodge: "Casual Elegance In Natural Surroundings." You will his place! The unique architecture of the buildings adds to this feel, with the main parts of the building in the traditional barn motif, with country hip roofs, peaked with proud gables. It's a very welcoming view as you drive up in daylight, and an awesome view at night as well. While you are on Highway 57 (off of the main Highway 42), you can truly walk to downtown Sister Bay, which is an added benefit. No. 205 has bedroom with king bed, living area, bath with large shower, kitchenette. New kids area in 2018! In 2008, Birchwood Lodge began to incorporate a series of "green" goals, and is focused to Reduce, Reuse, Recycle. Click here for their "green goal" progress. New in 2018: The newest addition to the property -- a kids area! Mom and dad can take a break while the kids play outside! We spent all of about 2 hours touring the resort (which opened in June of 2001), speaking with guests, and meeting with The Birchwood management. ight up to the next level, which is open and overlooks the lobby area. You can just see a wedding party photo snapped right here in this idyllic setting! The sand colored tile floor, matches well the birch. To the right, the registration area, with complimentary coffee, and breakfast baskets of juice, muffins and fruit available for purchase. A relaxing area with couches, tables, reading material flank the limestone fireplace with hand-hewn mantel offers respite on the other end of the lobby. The knotty pine ceiling and iron-frame chandelier complete the look! Welcome to the Birchwood Lodge! Let's begin our tour of the rooms and facilities. Decorative wall lamps complement the ceiling lighting in the wide hallways that lead to the rooms. Beautiful 6-panel birch doors in clear finish grace the halls. The stairways are spacious, well lit with lots of natural light streaming through large windows at each landing. 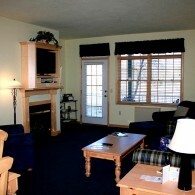 We toured representative rooms for this resort to get a good feel for what is offered. We first toured #201, a one bedroom unit, with sage carpeting, moss fabric couch, fireplace with birch surround, with TV and VCR above the fireplace, a round birch table and wood chairs with fabric seats. A door led from the living room area to a balcony with Adirondack chair. A full kitchen allows you to prepare a meal, keep snacks and drinks, and stock up. The bedroom, with toast carpeting and soft, cream walls (nice that they're not white), benefits from the two-sided fireplace (the other side is in the living room as we described), a king bed with birch spindle head and foot boards (done up in beige and floral bedclothes), side tables and a double whirlpool. The bedroom also has a door leading to the balcony. Another door leads from the bedroom to the bathroom, while a general bathroom access door is a pocket door. head, done up in tope tiles, is nothing less than awe-inspiring! Wow -what a shower! Hard to leave this room, but off we go! Next, we toured #205, a unique room that has a "flow-through" design, as a wall separates the living room area from the bedroom area that's off to the left. Yet, the corner that the bed faces has the fireplace and TV, and this corner is also visible from the living room couch (the wall serves to block the view of the bed from the living room, and the living room couch from the bed). It is quite nice. The king bed with green ivy bedspread, coordinates well with the blue/yellow plaid window toppers, and blue carpeting. White, wide-slat blinds provide privacy at each window. A large built-in cabinet in birch hugs the wall on the bedside of the dividing wall, and a 2-person whirlpool offers some tranquility. The living room area is a relaxing setting, with a double-sleeper, cushiony seersucker striped couch in white with blue/yellow stripes, opposite the fireplace, coffee table, end tables and additional chairs. A doorway leads to a covered balcony, where a couple of Adirondack chairs await you. 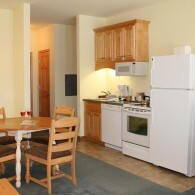 The kitchenette includes an ice bucket, small sink and counter top, coffee maker, and small fridge. Cabinets, with a microwave, add more options for eating in or snacking. The bathroom has earth tone tile, double sink and large shower with sliding glass doors. In the shower, two benches offer rest. The walls, in a soft yellow, add additional warmth. - "Clean, clean, clean! Love the shower!" - "Our next stay will be longer so we can completely enjoy your facility." - "Great rooms, quiet stay; we will be telling friends about our stay." - "Beautiful resort and room!" We found all of this to be the case in our personal examination of the resort! The Rest of the Resort! To complete our thorough tour, we visited the swimming pool area inside, fitness center, and even visited the locker room. The indoor pool, which ranges in depth from 3 - 5 feet, is surrounded with green and white striped lounge chairs, tables, and 20 windows to let in lots of natural light. This beautiful pool area also has a 12-person hot tub, and overlooks the outdoor pool. The locker rooms were clean and efficient, offering a shower and changing area just down the hall a few feet from the indoor pool. The fitness center had about 5 machines, so you can stay fit while on vacation. Other amenities (beside the heated indoor and outdoor pools) include a sauna, game room, tennis court, bicycle rentals, outdoor grills and even laundry facilities for guests who are staying longer! And we took a peek at the two conference rooms that are available as well for family reunions, business seminars and more. Capacity is between 85 and 120 people. And Birchwood is open in the winter too! This is a great resort, offering superb rooms, great amenities and lots to do. Great for families and couples alike. If you are looking for a great resort, check out Birchwood Lodge, and please tell them that DoorCountyNavigator.com sent you - that helps keep this site alive & well for you! Also please refer to their Property ID # DCN- 337 when booking your stay.